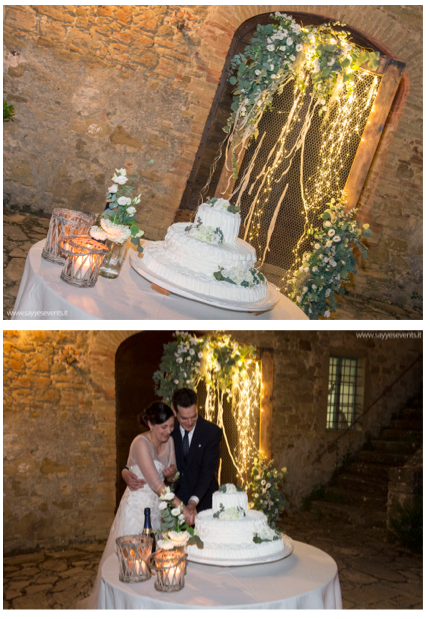 An unforgettable wedding took place in our Historical House with wedding planning, equipment, sets and theme of the wedding organized by “Say yes Events”. 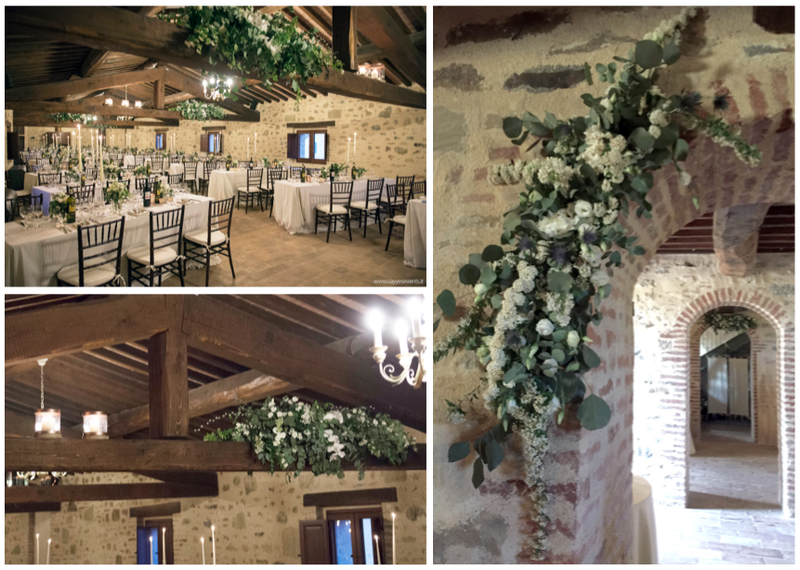 For the preparation of the location and the different areas we wanted to enhance the architectural and natural features of the medieval village, nestled in the nature and setting of the farm made of olive groves and vineyards. The intention was to propose a cutting edge and glamorous theme for the wedding, which would follow the latest trends in wedding and perfectly in line with the peculiarities of the Historical Residence. 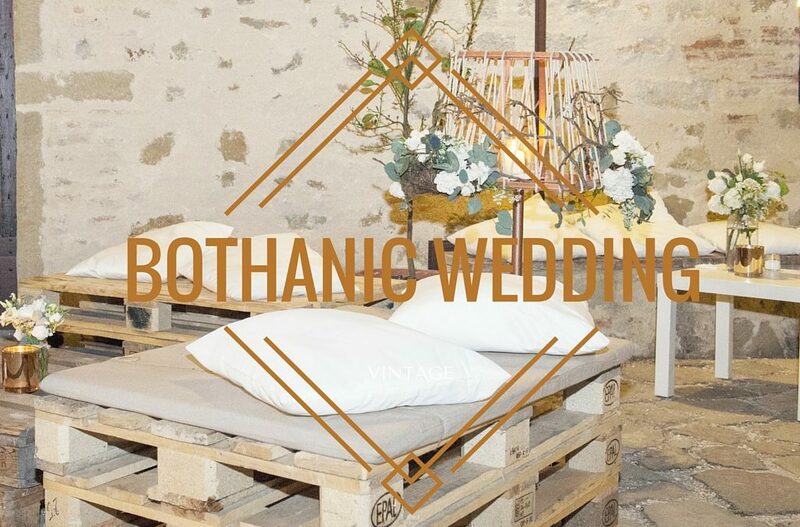 So, having captured the attention of the wedding couple and their taste, we have created an Eco-Botanical Wedding, characterized by an ethic and ecological nature, and by a typical Umbrian background. 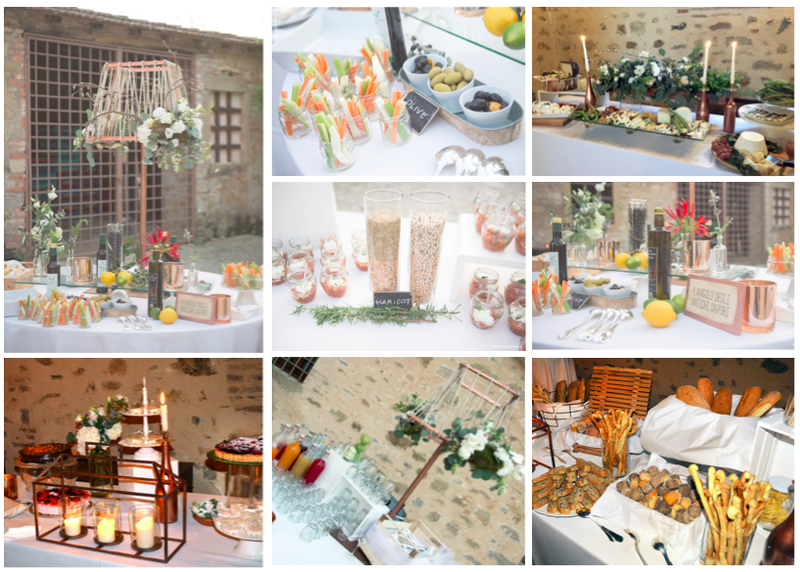 The result was a perfect combination of glamor, rustic, green, scenic refinement in a natural and bucolic atmosphere, and a genuine quality food experience with products at zero km and the exciting peculiarity of our region. Nothing but natural artifact inspiration where flowers and foliage are at the center of the scene, not just simple decorative elements, but the pillars on which is based the theme of the wedding. The dominant colors were white and green, and ancient materials were used, such as copper and recovered raw wood. We have created an experiential path for spouses and guests that would allow a full use of space, divided into several times. 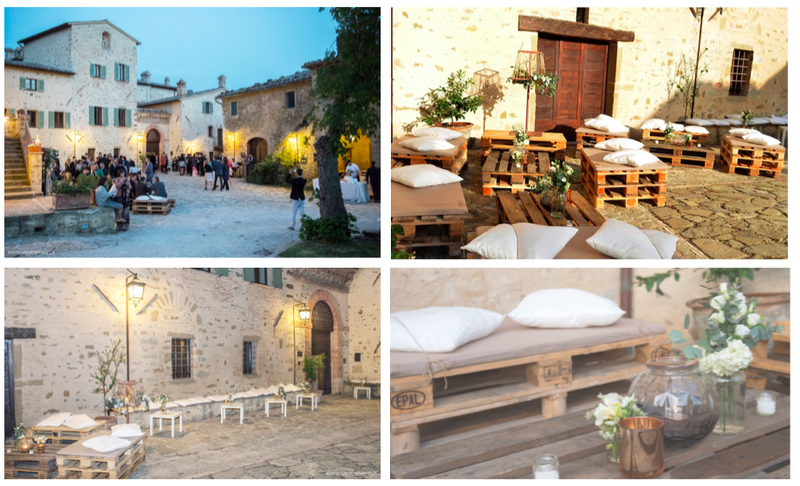 EXTERIOR – welcome with an aperitif in the old sandstone square, with sessions on pallets and white pillows. 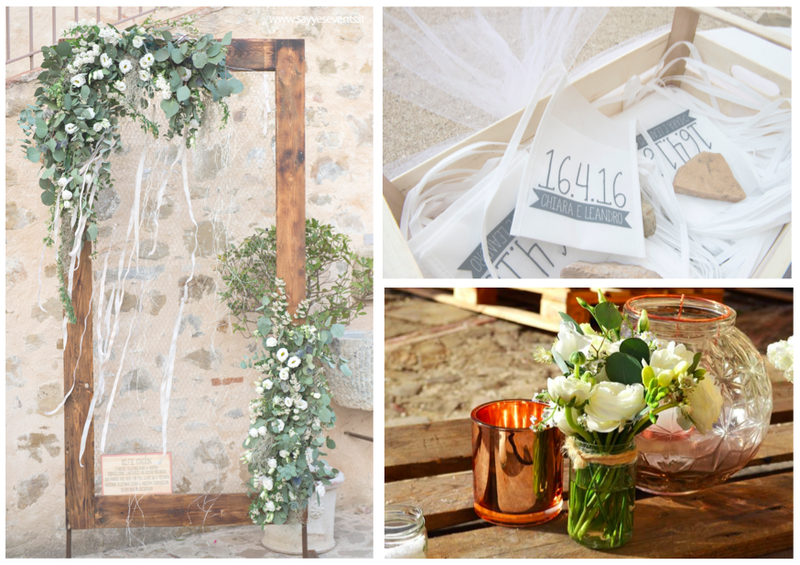 We have distributed personalized goblet holding straps and this space, decorated with wood and flowers, has been used as a “Selfies Station” corner. INTERNAL – the compositions have framed the stone arches of the rooms and found a natural support on the ancient ceiling beams, creating an outstanding effect and enhancing the architectural perspectives of the tabernacle. The dinner time was characterized by a romantic table setting with white tablecloths in natural fabrics, candles and centerpieces with small flower bouquets inside clear glass jars. The buffet, was embellished with copper candle holders, lamps and flowers in the bottle. Starring the food: a bakery corner with many types of bread, different in taste and in their geometry, tasting of extra virgin olive oils, local meats and cheeses. Wedding Cake Time: proverbially one of the most anticipated moments of the wedding party. The after dinner was back outside in the garden, overlooking the Umbrian hills and the pool. A pure white wedding cake, embellished by ivory and green floral decorations, placed on a wooden background that gave a romantic and bright charm. 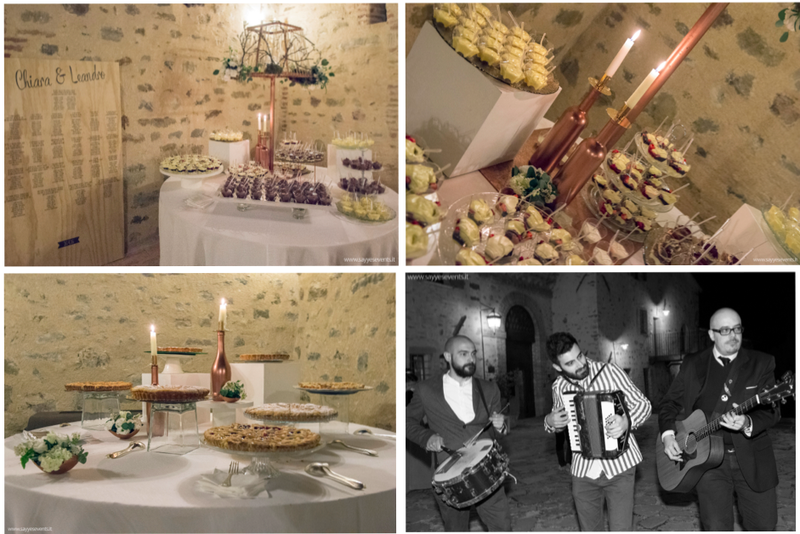 The celebrations continued late into the night in the cellar with dessert buffet, Open bar and live music.